This synthesis report will be of interest to highway and other transportation safety specialists and researchers. It describes the current state of the practice for countermeasures to reduce drowsy driving and the crashes that result from drowsy driving. Information for the synthesis was collected by surveying U.S. and Canadian transportation agencies and by conducting a literature search to gather additional information. 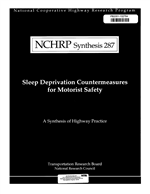 This report of the Transportation Research Board provides information on sleep deprivation countermeasures for motorist safety. These countermeasures are presented within five distinct categories: public education and awareness, new technologies, and roadway, environmental, and regulatory and judicial countermeasures. In addition, three examples of noteworthy state department of transportation countermeasure programs are provided.